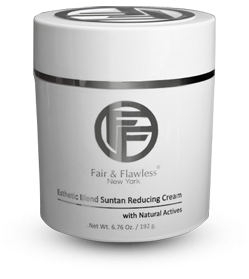 Reverses sun damage to restore and correct skin tone while softening UV-damaged texture. Correct, lighten, and restore sun-damaged skin by evening out tone and texture. Within days of first using this deluxe cream, you’ll start to see dramatically smoother, healthier-looking skin. Highly-concentrated active ingredients are precisely pH balanced to immediately begin to resurface texture and minimize discoloration and reveal the healthy, flawless glow beneath. Any hyperpigmented or ashy patches seem to melt away. Even knees and elbows become elegantly smooth, soft, and supple. 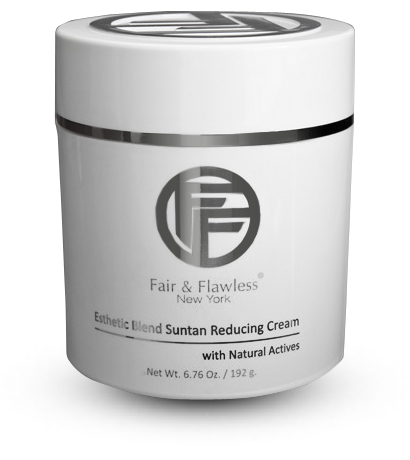 This marvelous cream is sister to our famous Fair & Flawless Suntan Removal Cream, but with four times the concentration of active ingredients. It will give you the amazing results you hope for faster than you dreamed possible. Apply to sun-damaged and darkened skin over your body twice per day. Use a gentle circular motion, making sure to massage along the hairline and up behind the ears (to avoid dark lines where the application ends). Pay special attention to heavily pigmented areas. Aqua(Water), Tetrahexyldecy Ascorbate (Vitamin C Ester), Lsoprpyl Palmitrate, L-Tycrosine, Glycolic Acid, Cetearyl Alcohol, Urea, Cylomethicone,Sodium Carboxymethyl, Beta-Glucan, Butylene Glycol Tocopheryl Acelate, Camellia Oleifra (Green Tea) Leaf Extract, Niacinamide, Dimethiocone, Celeareth-20, Phenoxyethanol, Ethoxydiglycol, Glceryl Stearate, PEG-100 Stearate, Avena Sativa (Oat) Protein Extract, Dimethyl MEA (DMAE), Caprylyl Glycol, Kojic Acid, Sodium Hyaluronate, Allantoin, Bisabolol, Citric Acid, Rosmarinus Officinails (Rosemary) Leaf Extract, Elaeis Guineensis (Palm) Oil, Castor Oil, Tocotrienols, Sepiwhite MSH, Ascorby Palmitate (Vitamin C Ester) Zinc Sulfate, pyridoxine HCI, Pantehine, Sorbic Acid, Disodium EDTA, BHT, Tocopherol, Palmitoyl Oligopeptide (Neuropeptide), Palmitoyl, Teltrapeptide-7 (Neuropeptide) Nonapeptide-1, Phaseolus Lunatus (Green Bean) Extract, Benzyl Beanzoate, Fragrance. I am totally impressed! Had a summer tan on my arms that refused to fade away. This cream evened me out in 2 weeks. Yes it works...It melts into the skin with zero oily or greasy feeling, I saw results in 3 days. & it also smells glorious an almost edible scrumptious warm feeling to my skin, no need for under arm deodorant, so worth the hype! !